Run time is approximately 1 hour 40 minutes including intermission. Fred Bishop is delighted to be returning to Broadway Rose for another season. He was most recently seen here as Magaldi in Evita. Before that production Fred appeared in Cole and performed his one-man show, The Music in Me, for the inaugural Broadway Rose cabaret series. A performer with over 25 years of experience, Fred has done numerous appearances on Days of Our Lives and General Hospital. This versatile performer has also done voice-over work for the films The Holiday and The Pursuit of Happyness. Todd Tschida feels honored to be doing another show with Broadway Rose. You may have seen him here in Celebrate Home, as Joly in Les Misérables, Jinx in Plaid Tidings and Tony in Haulin’ Out the Holidays. You may have also seen him out at Lakewood Theatre Company recently as Owen Musser in The Foreigner, Leo Bloom in The Producers, Richard in The Man Who Came To Dinner, Rugby in A Flea in Her Ear and Barnaby in Hello, Dolly! Some of his other favorite roles in the area are Homer in Floyd Collins (Stumptown), Dickon in Secret Garden (Staged! ), Jinx in Plaid Tidings (Triangle Productions), and Seymour in Little Shop of Horrors (New Century). Todd studied theater and music at Eastern Oregon University. Yohannes Murphy is very excited to make his debut performance at Broadway Rose Theater Company in this very special production. Recent roles include: Judas in Godspell, Curtis in Dreamgirls, Wiz in The Wiz, as well as performances in the Portland area jazz scene. Yohannes continues to study and develop in all areas of performance studies. ‘I Left My Heart’ review: Broadway Rose production pays stylish homage to American legend Tony Bennett By Holly Johnson The Oregonian, Apr 16, 2011 The production at the Broadway Rose features three fine vocalists and live musicians onstage focusing on the music…Director Sharon Maroney, helped along by musical director Rick Lewis, respects the individuality of each of her three actors and their voices, yet has them blend tightly onstage when the need arises…Read the rest here. 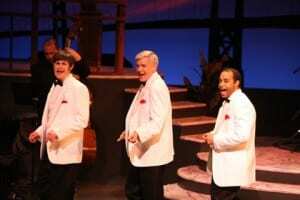 Fred Bishop, one of three singer/actors to perform in the upcoming Broadway Rose Theatre Company’s production of “I Left My Heart – A Salute to the Music of Tony Bennett,” has worn many hats during his long career…Read the rest here.